This is the church where Charles Dickens was married in. Description: St Luke's was consecrated by the Bishop of London on St. Lukes Day October 18th 1824 and was built because the original Parish Church (now known as Chelsea Old Church) was regarded as too small for the increasing population. The Architect was James Savage, one of the foremost authorities on medieval architecture of his time and the church has a grandeur of conception and a great attention to detail. It is built of Bath stone and the resemblance to Kings College Chapel in Cambridge is quite striking. On the exterior the flying buttresses and the pinnacles along the parapets give an added feeling of height. There are many memorials to local people around the church and of particular note are those to the Cadogan family who remain Patrons of this parish. On the east wall of the north gallery, the memorial to Lt. Col Henry Cadogan who was killed in 1813 in the Battle of Vittoria, is by Sir Francis Chantrey. To the left of the altar there is the memorial to Luke Thomas Flood, who died in 1860, having carried out many charitable works in Chelsea. His name is perpetuated in Flood Street. 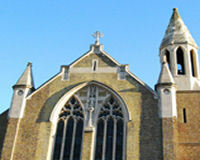 Charles Dickens was married in this church to Catherine Hogarth in 1836: the wedding took place two days after the publication of the first part of Pickwick Papers. John Goss who wrote the hymn Praise my soul the King of Heaven was organist here as was John Ireland. Charles Kingsley who wrote The Water Babies, was associated with this parish, of which his father was Rector from 1836-1860.